I once met someone at a big Christmas lunch who fit your song perfectly in every way but the trousers, and spent the next hour smirking so badly I was worried someone would ask why. That and the comedy associations of Good King Wenceslas and God Rest Ye Merry Gentlemen, and there is a lot of smirking happening this season. Tealin - Still, I imagine the smirking just helped you fit right in. I am inordinately envious of him for having a biscuit . Anon - Be jealous no more- he didn't have a biscuit. 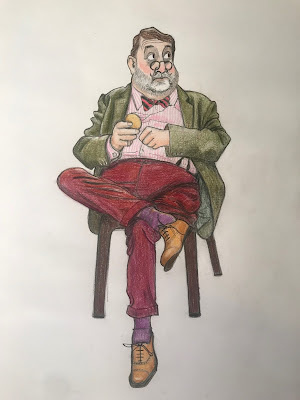 He had a phone, like everyone else I try to draw in public, but I'm bored of drawing people with phones, so instead I gave him the biscuit I felt he deserved. He surely has the wistful look of a man in want of a dunkworthy fluid.